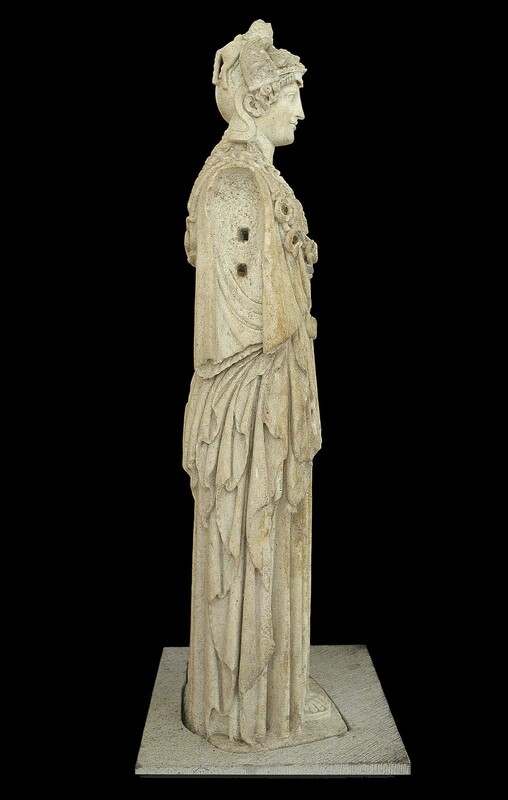 2nd or 3rd century A.D.
Sculpture in Stone and Bronze (MFA), no. 019; Highlights: Classical Art (MFA), p. 040. Roman-period replica of the cult statue that once stood within the Parthenon on the Athenian Acropolis, a chryselephantine (gold and ivory) colossal statue designed by the master sculptor Phidias and . dedicated in 438 B.C. The goddess wears a helmet on which are remains of Pegasoi on either side flanking a sphinx of which only the paws remain; above the visor are parts of protomes, probably deer; griffins in relief on the cheek pieces. Curls frame the face, tresses fall on her shoulders. Gorgon on aegis which is edged by snakes; snakes encircle her waist forming knot at the center. The head and neck were carved of a lighter marble than the rest of the figure. Joins are confirmed by matching curls above the left shoulder and the hair below the helmet and on back of aegis. Restored areas include a small part of the left eyelid, tip of the nose and left nostril, much of the lower lip and the end of the chin, and the curl of hair on the right side of her neck, including a small portion of the curved lower end of the helmet. There are no restorations on the body. 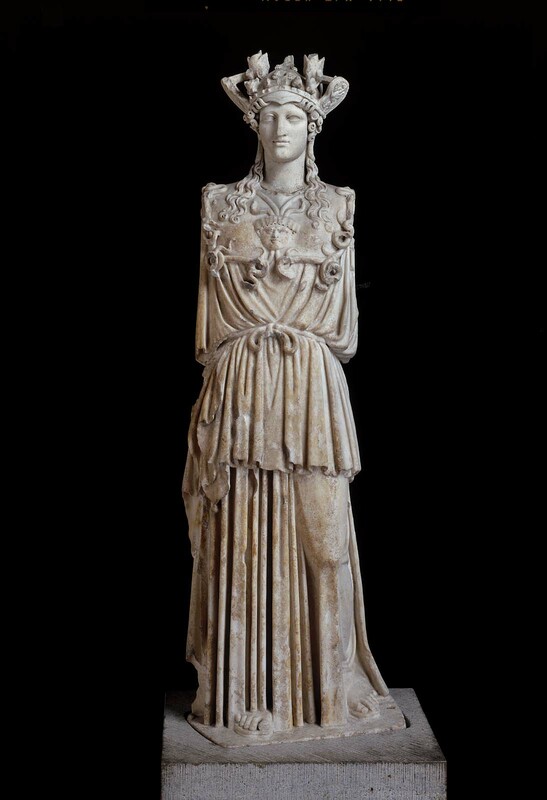 Traces of paint remain on the lower curls on Athena’s left shoulder. Ancient iron pegs are visible in the troughs of the arms, along with larger dowel holes for fitting the arms and the weight they supported. Some surfaces were carefully cleaned long ago; others preserve good root marks. Harvard Lab No. HI752: Isotope ratios - delta13C +2.76 / delta18O -8.63, Attribution - Pentelikon, Justification - Sparkling, fine grained marble. NOTE: According to curatorial statements at the time of acquisition.